Hi blog public ... well I'm back from spending a week in Kazakhstan, speaking at a tech conference called ASTEX 2014, and wow was it a great experience. I saw a lot, met a lot of interesting people, and had a chance to get clear perspective on the US and the tech scene in 2014. "Mobile first" is the perfect message for Central Asia. Everybody has a smartphone - Android is much more popular than IOS - far fewer have laptops. Hadoop is everywhere, the MySQL of the 2010s. There are giant online companies which are very successful you've never heard of. Every country / region has it's own Google, Facebook, LinkedIn, Amazon, eBay, and PayPal. Paying for stuff online is hard. Most people don't have credit cards, many don't have deposit accounts. Stored value instruments are popular. Bitcoin and its cyber currency brethren are taken very seriously. Physical infrastructure is lacking. No Fedex or UPS. Kazakhstan is nearly the size of the US, with few roads, cities, or even people. Biggest question when you order online is not when will it arrive, but how. Images are huge. With such a potpourri of languages and alphabets and cultures, a picture is worth way more than 1,000 words. Video is big too and getting bigger. 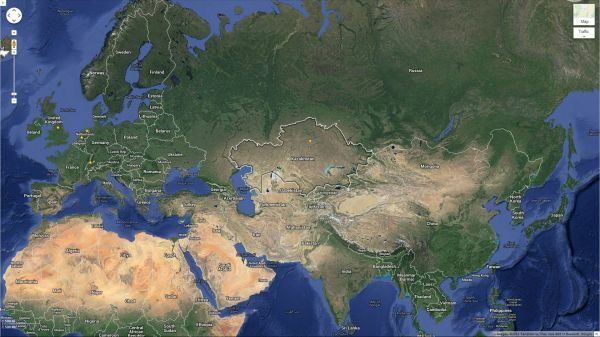 Kazakhstan is huge - and directly in the middle of Eurasia. And Astana (yellow star) is in the middle of Kazakhstan. presenting ... The Future Store: Mobile e-Commerce! grilling horsemeat on a hot stone - delicious! the Presidential Palace, known locally as "the white house"
no guards in sight ... should I climb the fence? perfect end to the trip - strudel! I'm sure I'll have more thoughts about this amazing trip after I have time to digest ... please stay tuned!